SMRO- Governors Transitioning Youth Initiative – April 17, 18, 24 and 25, 2019 | Service Coordination, Inc. Transition is more than about just services; it’s also about values. The DDA has adopted an Employment First philosophy and seeks to align its service delivery system with that philosophy. Transition planning is when a student with a disability, along with family members, the school system, and service providers, begin to officially plan for life after high school. Transition planning should begin when you are 14 (if not earlier!). This may sound very early, but if you plan to apply for services you may need to get your applications in before you graduate so your supports are ready for you when you leave school. 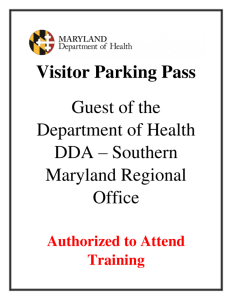 If you wish to learn more information about this training, please feel free to contact Nicole LeBlanc at nicole.leblanc@maryland.gov or at 301-362-5140. Please print out the parking pass and place in your dashboard.